Hue is located at the very heart of Vietnam and for 143 years, this served as the capital of the country. This is why it is not a big surprise that this city is filled with rich history and interesting culture. 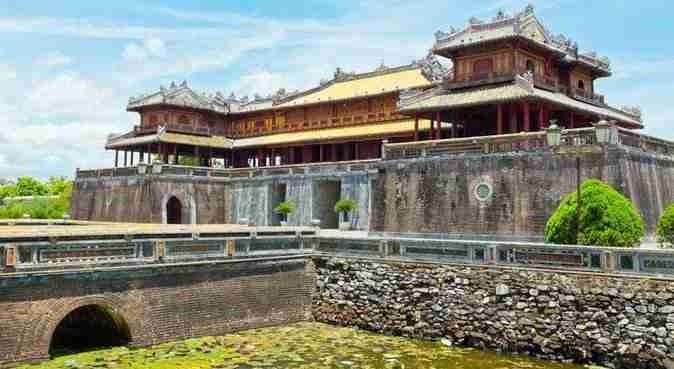 Hue also serves as the home to seven imperial tombs and even the ancient imperial city. It suffered badly during Vietnam War, with the Battle of Hue considered as among the deadliest and longest battles. Aside from human casualties, a lot of historic sites were also destroyed or damaged during the battle. For a long time, the city of Hue served as Vietnam’s center of Buddhism. With some of the major events of the 1963 Buddhist Crisis connected to it. Add it up to Hue’s historical significance, breathtaking monuments, and beautiful landscape, it is easy to see why Hue is one place where you will be inclined to explore and discover. 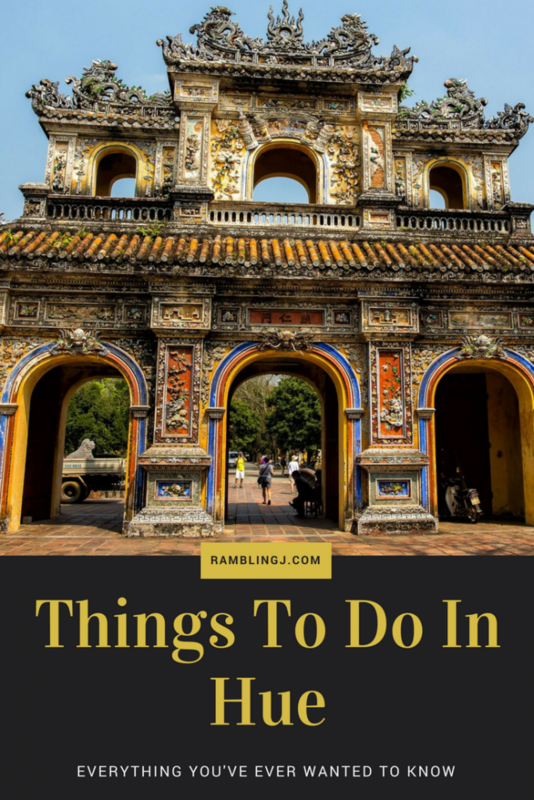 Here is our list of a few things to do in Hue Vietnam. It is quite sad to see how the Hue Provincial Museum needs maintenance, with its walkways having some holes and with the grass needing a good cut. The indoor museum itself has artifacts and photos although there were only few English explanations. 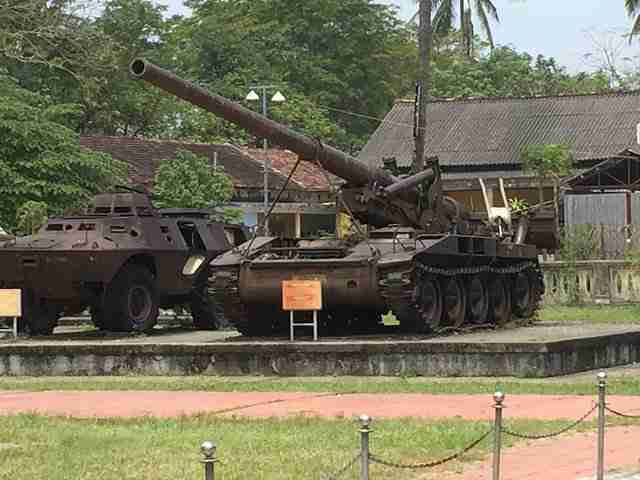 If you will consider the significance of those battles which happened in Hue, this museum failed to give justice to the memory. However, it doesn’t mean that it is not worthy of a visit. If you are into wars or history, a quick drop by here will give you something to marvel at. If you happen to be in the Imperial City, it will just take a few steps for you to reach the museum. The front grounds are dotted by several planes, tanks and even a helicopter that are all remnants of the Vietnam War. The placards written in English and Vietnamese explain where each vehicle was acquired and from whom and this in itself is already fascinating. The palace and walled fortress used to be the home of emperors of Vietnam. Also known as The Citadel, the grounds of the palace are surrounded by an impressive waterlilly-filled moat. The moment you step inside, you will be able to see the buildings that were damaged, its original and restored stages. See to it that you ask the driver to drop you off at the right gate to start your discovery. 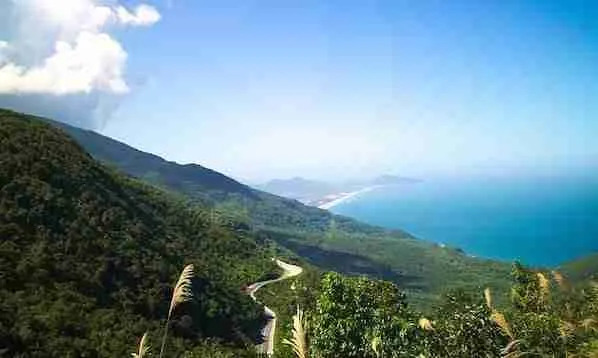 You got two choices if you will drive to Hue from Da Nang. First, you can take the Hai Van Tunnel. This tunnel is considered to be longest in Southeast Asia at 6.28 kilometers long. Another option is for you to take Hai Van Pass. This pass is actually a mountain road that will take you up and down, then around the coastline. Here, you will get to see some really spectacular views, making a favorite among people who travel by motorbike. Tour buses and drivers park for several minutes at the pass’ highest peak to stretch their legs and take in the view. It isn’t only renowned for its beauty, yet the pass is also notable for its difficulty and danger. That is the main reason why Hai Van Tunnel was created. There are times that sharp curves make it impossible to see traffic. Oftentimes, the road is also covered with thick fog, yet there are some cement railings to prevent falling off from the mountain. 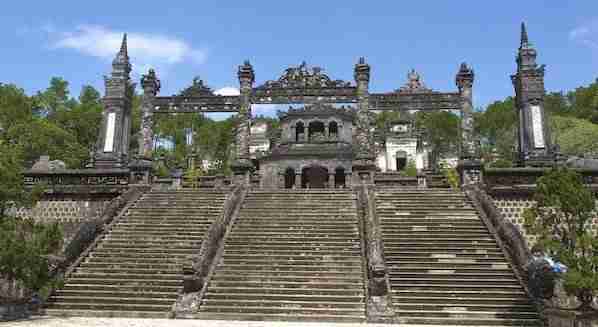 It’s considered as the last imperial tomb in the country of Vietnam. For those who don’t know, this tomb took eleven years to build and this was completed in year 1931. This should be on top of any list of things to do in Hue. 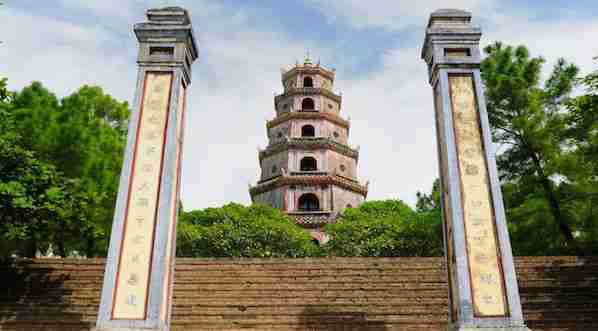 In spite of being quite a recent addition, the Khai Dinh Tomb is considered as one of the famous tombs in the area. Emperor Khai Dinh spent most of his life in France. That’s why the tomb is a combination of both Western and Eastern designs. Climbing up the 127 steps up the mountain’s side will bring you to the temple fortified by the statue guards. When the inside visitors are in awe of the adorned walls with stunning photos made from porcelain and inlaid glass. The Perfume River flows through the Hue’s center. A lot of tourists consider taking a boat tour along this river. Passengers may enjoy river views, visit some major tourist spots and have a meal. Strolling along the walkways is another way of taking in the river along the edge of the river. During morning, the joggers may take their morning runs in this place. During evening, this place transforms with some restaurants and shops around. Overlooking Perfume River on the Ha Khe Hill, the 7-storey Thien Mu Pagoda is considered as the tallest religious building that can be found in Vietnam. This was established in 1601, yet the tower was only constructed by 1844. This one of the more popular things to do in Hue. The grounds of the temple aren’t only attractive but also it’s a site of political significance. During 1963, there’s was Buddhist Crisis and Catholic government cracked down the country’s Buddhism in spite of most of the Vietnamese were Buddhist during that time. When the 9 unarmed Buddhists were killed in Hue, the Thein Mu Pagoda became an organizing point for people who are involved in this movement. When government refused appeals for the religious equity, Thich Quang Duc, a Buddhist monk, drove to Ho Chi Minh City and sacrificed himself through burning himself on fire. Malcom Browne witnessed and captured the event. At the back of the photo, you’ll see the car that Thich Quang Duc used. If you do not know where to look for it, you might miss it, yet tucked to the building’s side behind the Thien Mu Pagoda’s main prayer hall, the car is displayed to commemorate the events. Hue has loads of guest houses, hostels, and hotels. 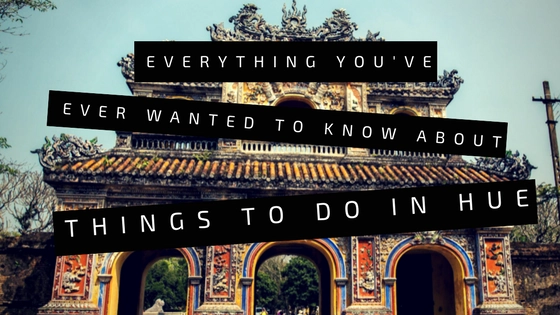 Here are a few places to check out if you are planning to visit Hue Vietnam. Elegantly furnished, all rooms are air-conditioned and feature wooden flooring and large window. A flat-screen TV and kettle are included. En suite bathroom comes with shower facility and a hairdryer. All rooms are fitted with a TV for entertainment, and are fitted with a private bathroom with a bath or shower. This accommodation features free WiFi and private parking. Midtown Hotel Hue is set within a 5-minute walk from Huong River. Free Wi-Fi is available at all areas. Furnished with wooden flooring, air-conditioned rooms are equipped with a seating area, a TV with cable channels, and a minibar. Shower facilities, a fluffy bathrobe and free toiletries are included in an en suite bathroom. Finally, once you visit Hue, you will have plenty of places to visit, explore, discover and with many more things to do in Hue. All you have to do is to choose the activities you prefer and start enjoying what Hue has to offer.